Says U.S. has "a solemn duty and a moral imperative" to block Iran from having nuclear weapons. Republican candidate for president Mitt Romney said Sunday that the U.S. has "a solemn duty and a moral imperative" to block Iran from having nuclear weapons, and that it should lead the efforts to stop Iran from achieving that capability. He began his speech by saying that it was "a moving experience to be in Jerusalem -- the capital of Israel," eliciting extended and excited applause from the audience. In what was seen as a hinted slight to President Barack Obama, Romney said, "It is sometimes said that those who are the most committed to stopping the Iranian regime from securng nuclear weapons are reckless and provocative and inviting war. The opposite is true. We are the true peacemakers," he said. Speaking in Jerusalem against the backdrop of the Old City, Romney said: “History teaches with force and clarity that when the world’s most despotic regimes secure the world’s most destructive weapons, peace often gives way to oppression, to violence, or to devastating war… We must lead the effort to prevent Iran from building and possessing nuclear weapons capability." 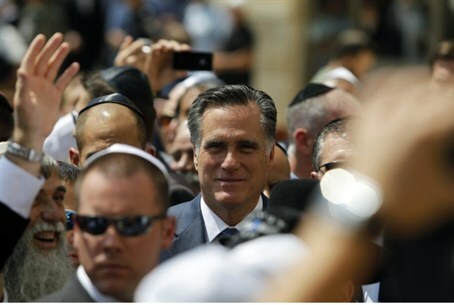 "The Jewish nation persisted through one of the most monstrous crimes in human history," Romney went on. "And now this nation has come to take its place among the most impressive democracies on earth. Israel's achievements are a wonder of the modern world. These achievements are a tribute to the resilience of the Israeli people. You've managed against all odds, time and again throughout your history, to persevere, to rise up and emerge stronger." He drew applause when he mentioned the terrorist crime at the Munich Olympics in 1972. "At this time we also remember the 11 Israeli athletes and coaches who were massacred at the Munich Olympics 40 years ago," he said. "And ten years ago this week, nine Israeli and American students were murdered in a terrorist attack at Hebrew University." "Tragedies like these are not reserved to the past. They are a constant reminder of the reality of hate and the will with which that hate is executed upon the innocent. "When Iran's leaders deny the Holocaust or speak of wiping this nation off the map, only the naïve, or worse, would dismiss it as an excess of rhetoric. Make no mistake: the ayatollahs in Tehran are testing our moral defenses. They want to know who will object and who will look the other way. My message to the people of Israel and to the leaders of Tehran is one and the same: we will not look away. Nor will my country ever look away from our passion and commitment to Israel." "We should stand with all who would join our effort to prevent a nuclear armed Iran. And that includes Iranian dissidents. Don’t erase from your memory the scenes from three years ago, when that regime brought to death its own people, as they rose up. The threat we face does not come from the Iranian people but from the regime that oppresses them."